When the snow was at its peak in London an incredibly weird thing happened. Strangers were friendly and spoke to one another, it was even reported in newspapers. One small boy told his father that he liked the way everyone was so nice to one another when it snowed. Bring on the snow I say. The melting of the snow is dissolving the euphoria. we got nothing like the amount you got but are fearing a huge dump soon - good to hear some good came of it. Awesome shot, I cannot wait to visit London for the first time this summer. How many days of snow do you get during an average winter? Very few, I suppose. Maybe none at all. What a nice story about the little boy! This is a lovely shot. This is a good shot and excellent accompanying story. I see a lonliness here but resolution. The juxtapositioning of the two chairs, the snow and green creates a certain dynamic tension as does the framing you have done with the leaves... much as one would do if taking a picture of a bird. Gives the emotion captured a sense of authenticity. 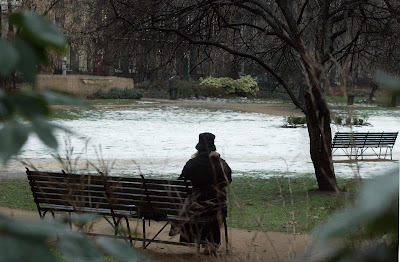 There is a timelessnes as well, with the snow, the older fashioned hat,longish dress and the certain "victorian" feel that makes this scene characteristically English. I do not mean to judge. I am simply trying to tell you how the photograph affected me. "Strangers were friendly and spoke to one another, it was even reported in newspapers." Being from the south where we speak to EVERYONE, this surprises me a little about London! Maybe it will continue. I hope so. Your photo drew me in from the portal. What a poignant capture. Timeless indeed. I think is rather sad that you need a bit of snow so that people start talking to one another! Same happens when you walk a dog. Dogs seem to "unite" people...Well, better than nothing! Ciao. A. Same experience in Paris! Now, of course if we had snow every day, I don't know if it would work! Lovely photo. Wonder what it is about snow that makes people so nice. I think it has the opposite effect here unless it's right before the holidays. hola amigos de inglaterra gracias por permitirme este espacio y estoy seguro de que el blog es estupendo. This sort of thing makes me feel so positive. We're all told as children not to speak to strangers, but we seem to carry that on til adulthood, which is a bloody shame. Lovely shot, theres a real warmth to the picture, despite the chilly snow!